Windows play an important role in your house. Without them, a space can look dark and dreary, especially if there are little or incorrect use of artificial light. Aside from being a great source of natural light, windows also help with ventilation. They air out the home (and let fresh air in) as well as help keep warmth in during the winter months in cold areas. Before delving deeper and taking a peek into the world of windows, here are a few ground rules. Different types of windows also require specific window treatments. With the wealth of options available in the market, you can easily be overwhelmed. Casement windows, for example, come with various considerations when it comes to draperies. At the same time, draperies also come in different colors, textures, and styles. Casement windows are a type of window that usually open by means of hinges on one side. The hinges can also either be on top or at the bottom, and can either open out or be pulled in. Now, to define draperies is another matter. Most people use the term draperies interchangeably with curtains. In a stricter sense, there is a difference between the two. Curtains are lighter, thinner and more sheer. They are usually airy and can be very colorful. Drapes, on the other hand, are made of a heavier fabric and are almost always lined. The latter is best used for privacy and to block out light, cold, and heat. For this discussion, let’s all agree to disagree and use both curtains and drapes to illustrate examples. Determine what the room’s purpose is before deciding which drapes to use. If you want that room, such as your bedroom, to have more privacy, then choose to use heavier drapes. Blackout drapes work best for this purpose and are most effective in blocking out light and noise. However, if the room is meant to welcome natural light and air, such as kitchens and sunrooms, then curtains with a lighter fabric are best. What is the basic function of your window? Will you need it as a source of natural light? If so, then opt for roller or pleated shades. 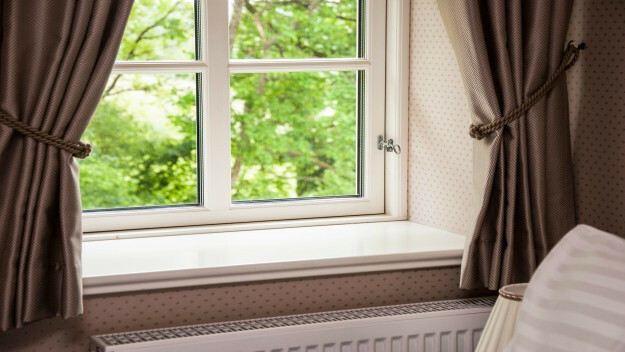 Will your window be frequently being opened or closed to let air in or out? Then choose drapes that are not fussy to work with like swing-arm rods or tab-top panels. The color, fabric, length, and lining of your draperies can spell a world of difference in making your windows pop out. The material of your drapes will dictate how they will hold out over time. Linen, silk, faux silk, and velvet are best because they tend to hang well. Faux silk is also preferred by most decorators since it’s the most durable and doesn’t deteriorate as quickly as real silk. To help keep out the cold, drapes can be lined and interlined. Interlining means having a thick, insulating material inserted in between the face fabric and the lining to give the drapes body and fullness while helping prolong its life. You also need to consider the height, width, and relative distances between the windows and where you want your drapes to start and end. Ideally, pros recommend hanging curtains about six inches or higher from the window frame to give an illusion of height and a more dramatic look. Drapes should also puddle slightly, kiss the floor, or just hover about half an inch off it. On the sides, your curtain rod should extend about three to six inches off each side to give a sense of breadth and make it look wider. Curtains or drapes can be bought at any home store section or you can also have some custom made for your home. If you can, go for custom drapes so you can specify exactly what you need for the windows at your house. If this is not possible, then spend some time going through the retail window treatment options to find the right size and fit that will complement your windows at home. Keep in mind that you will need to check whether your drapes are easy to maintain or not. Some fabrics, especially high-quality ones, cannot withstand machine washing and may need to be professionally dry-cleaned only. Also, remember that bright colored materials tend to fade out with frequent sun exposure, so it is best to have this in mind when choosing your drapes and thinking of longevity. If you don’t have time (or funds) to routinely send the drapes to the cleaners, you can also opt for machine-friendly materials that may have a shorter life span but are easier to maintain. Deciding on the best drapery to use for your casement windows can be a daunting task if you have no idea where to start. Pointers such as the ones mentioned above can help guide you towards achieving the look that you have in mind. There is no hard and fast rule, however, as to the exact and perfect fit because it will all depend on different factors at your house – tricky spots, budget, space and such considerations. A one-size-fits-all policy may not work too well so it is still best to consult a professional and discuss your project with them. Getting an expert to look into your project can make a difference. Allowing designers, decorators, or home contractors who are experienced in these kinds of projects will make sure that your home improvement plans won’t just fly out the window. Carmen Vellila is an experienced Brand Manager currently overseeing the strategic development of multiple brands as part of the Epwin Group. She is an Associate Member of the Chartered Institute of Marketing (ACIM), specializing in Corporate Communication and Digital Marketing.